Join Us for a Night of Fashion, Food and Fun! This year marks the 32nd annual Fashion Show at the Alex Madonna Expo Center. Two days filled with exclusive auction lots, one-of-a-kind performances, the newest and hottest trends and designs, and of course, the crème de la crème of the county! Proceeds from the Fashion Show will benefit local organizations. Unlike anything else on the Central Coast, this event highlights the musical and choreographed visions of our Executive Producers, Stephen Patrick and Todd LeMay, paired with the fashion of the Madonna Inn Boutique. Amongst the company of our dearest community friends, the show’s vision is pulled together under the direction of Executive Director, Toni Detz. 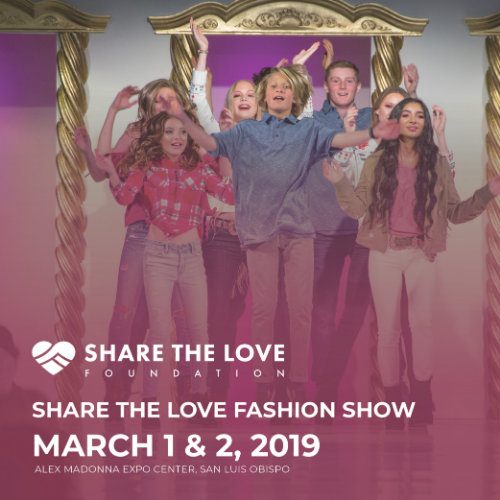 The 2019 Fashion Show will leave attendees inspired by the entertainment and proud to support our community in this one-of-a-kind way. Grab your friends and tickets soon so you don't miss out on the opportunity to be a trend-setter at this year's Fashion Show and support local non-profits! VIP & Premier tables are available for whole table purchase only. There are no refunds for Share the Love events. Deadline for any meal choice changes is February 7th.